As America’s unemployment rate rises, those paying the severest price aren’t necessarily in Detroit or Miami. One of the newest street children here in this northern Haitian city is a 10-year-old boy whose father was working in Florida but lost his job and can no longer send money home. As a result, the family here was evicted, the mother and children went separate ways to improve their odds of finding shelter, and the boy found refuge in an abandoned wreck of a car. The boy is one of 46 million people in the developing world — more than double the New York State population — who will be driven into poverty in 2009, according to a World Bank estimate. In Haiti’s largest slum, Cité Soleil, in the capital, Port-au-Prince, I stumbled upon a one-room public school. The principal, Claude Lafaille, lamented that enrollment had dropped from 150 at the start of the year to 60 today. “Haitians in America stopped sending money back, and so their family members can’t pay fees,” he said. The school used to provide free breakfasts to ensure that students got at least one solid meal a day. But in January, the charity that provided the food had to stop because its donations were dropping, so now the remaining children are often too hungry to concentrate. In the St. Catherine Labouré hospital in Port-au-Prince, the number of children admitted for malnutrition has approximately doubled since September, said a pediatrician, Dr. Armide Jeanty. She pointed to a 15-month-old child, Richardson, skeletal and covered with sores. He stared blankly, for when children are severely malnourished their bodies shut down and do not waste energy crying, laughing or smiling. It’s natural in an economic crisis to look inward, to focus on America’s own needs, but it’s worth remembering that the consequence of a deep recession in a poor country isn’t just a lost job but also a lost child. In Cité Soleil, a woman named Chantal Dorlus told me that her 5-year-old daughter, Nasson, starved to death last month, and neighbors confirmed the account. Ms. Dorlus said that her three other children would have starved as well if not for the generosity of her neighbors, who share their meager food supplies. If slum-dwelling Haitians can share what little they have, I hope we can be equally generous during this downturn when needs are greatest. Sasha Kramer, left, and Sarah Brownell, who run an aid group called SOIL, in front of one of their composting toilets. I was interested in their work because it addresses two of the developing world’s greatest but least glamorous challenges. One is sanitation, for human waste in poor countries routinely spreads disease and parasites. The second is agriculture, for poor countries must increase crop yields if they are to overcome poverty and hunger. Sasha and Sarah create dry composting toilets that turn human waste into valuable fertilizer. They say that the yearlong composting process kills the pathogens in the waste, making it safe to use the fertilizer. Frankly, I was taken aback when, 10 minutes after they had met me, they pulled out a Ziploc bag and proudly declared that it was compost made from their own toilet. They were so impressed with what they had accomplished that I felt obliged to take a whiff and hold it in my fingers; it simply felt and smelled like rich potting soil, and I would never have guessed its origins. Haitian farmers use virtually no fertilizer — less than a pound per acre, compared with about 90 pounds in the United States — and soils are severely depleted. But Sasha calculates that if half of Haitians’ human waste could be used as fertilizer, that would amount to a 17-fold increase in fertilizer use, more than doubling the country’s agricultural production. 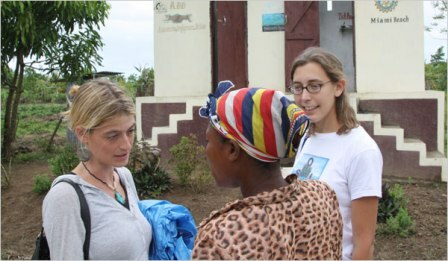 Sasha and Sarah have deployed 45 of their toilets, and now they are trying to introduce a municipal composting system in Cap Haitien. I don’t know if this is feasible. But I love the idea that even when the needs of the United States are so immense, a couple of young Americans aren’t complaining or finger-pointing, but are hard at work to assist others whose distress is incomparably greater than our own. No Replies to "The New York Times: A Boy Living in a Car by Nicholas D. Kristof"